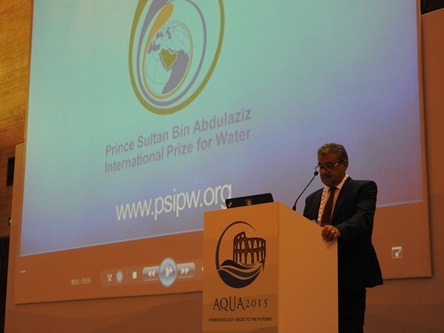 The Prince Sultan Bin Abdulaziz International Prize for Water was a gold sponsor of the 42nd International Congress of the International Association of Hydrogeologists (IAH) which took place in Rome Italy from 13-18 September. 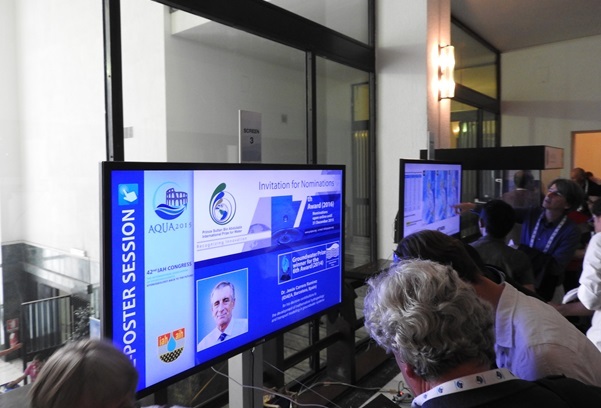 The title of the event, which is one of the most important groundwater conferences in the world, was “AQUA 2015: Hydrogeology, Back to the Future”. During the plenary session, PSIPW Executive Director, Ali-Wafa Abu-Risheh, gave a short speech before a screening of the PSIPW film which highlights the 6th Award prizewinners. The Groundwater Prize winner, Dr. Jesus Carrera Ramirez, was a particular point of discussion, since he is in a large part responsible for shaping the discipline of mathematical hydrogeology. In addition to being a gold sponsor, PSIPW was also the sponsor of the conference’s poster session, where it reached out to many of the world’s leading groundwater scientists, inviting nominations for the current 7th Award. Copyright © 2019 Prince Sultan Bin Abdulaziz International Prize for Water. All Rights Reserved.